Around the world, USAID facilitates inclusive economic growth by empowering women to reach their full potential. With programs that support female entrepreneurship, USAID creates a platform for women to become active in creating a prosperous future for their families and communities on a global level. As the 2017 Global Entrepreneurship Summit approaches, read more about how USAID is supporting entrepreneurial women in the countries where we work. Lula Mena is an artist and designer from El Salvador who uses her designs as agents of social change. Working with women in rural areas, her business is grounded in fair trade principles and utilizes local products and resources. USAID supported Lula with business and marketing support as she expanded her business and created more jobs. By training rural women in jewelry creation, Lula empowers these burgeoning female artisans to challenge gender norms and social paradigms by working outside the home — the income from which is enriching their families’ lives. When women thrive, communities thrive — the effects reverberating beyond international borders. Doaa Mohammed Bakr Turky was one of just a few girls in her class at an agricultural school in rural Egypt, where she learned farming practices at the USAID-supported institution. After participating in an entrepreneurship competition through her school, Doaa was awarded a prize to start her own duck farming business. Over time, her business has grown and has become a vital source of household income. “She boosted our income and improved our living situation, compared to how we were living,” says Doaa’s mother, Amal. Now, all of Doaa’s siblings are able to attend school as she continues to work to create a positive impact on the people around her. In Honduras, Dina Bila Dominguez Sanchez and her family live near a busy thoroughfare, abuzz with the constant noise of cars, buses and trucks. For Dina, however, the noise signals the sound of customers arriving to purchase her coffee, fresh bread and pastries and breakfast burritos each morning. When Dina first started her business, she was only able to sell a few loaves of bread per day. However after participating in USAID’s ACCESO program, she received essential training in both baking and business skills that helped increase her income. Through hard work, Dina has created a better life for herself and her children, and as a true entrepreneur is continuing to expand her business even today. Fatima Al-Jada has spent more than three decades building up a more sustainable textile industry in the West Bank. However this entrepreneur has humble beginnings, having started her career with a single sewing machine and a childhood dream of someday becoming a businesswoman. Today, Fatima employs hundreds of workers — most of them women. Her efforts are a vital contribution to targeting the high level of unemployment in the West Bank, especially among women and due primarily to structural barriers, political tensions and a lack of business investment in the West Bank and Gaza. Having earned significant recognition for her work — she received the “Women Entrepreneurs and their Role in Sustainable Development” award in 2006 and a grant from USAID in 2010 — Fatima’s entrepreneurial spirit and perseverance serve as an inspiration for her employees and women across the region. In Cambodia, Nanda Pok is a both a business owner and mentor for aspiring female entrepreneurs in her community. After participating in USAID-led training, she has continued to spread her knowledge of both coffee production and business with the women around her. Nanda’s work is guided by the core belief that when women are economically empowered, they become a positive force for development as their earnings flow back into health, education and the well-being of their families. By supporting women entrepreneurs like Nanda, USAID fosters increased prosperity and positive economic and social change that has global effects. From a young age, Amani Abu Tair was known to her friends and family in East Jerusalem as “The Little Inventor.” Her fascination for engineering and inventing has transcended into adulthood. As one of the 14,000 young Palestinians USAID has supported through the Youth Entrepreneurship Development Project, Amani has been able to pursue higher education and continue to innovate for good. Most notably, her “Braille FMZ” device is making braille education more accessible for blind children in Jerusalem and the West Bank. Today, she is seeking ways to support its manufacture on a larger scale. Amani is determined to become “the most successful entrepreneur in the whole world,” measuring her success by how she is able to positively affect those around her. Growing up, Maïmouna Coulibaly’s family was among the 80 percent of Malians relying on subsistence farming as their main source of food and income. She has a deep knowledge of the drought, conflict and lack of infrastructure that negatively affect livelihoods in Mali. However, when given the chance to spend time in Iowa through her husband’s USAID scholarship, Maïmouna was amazed to discover corn production methods in the agricultural state, consequently pledging to bring this type of farming back to Mali. Though facing some resistance at first, she put her newfound English skills to work, forging partnerships to eventually start her own seed company. 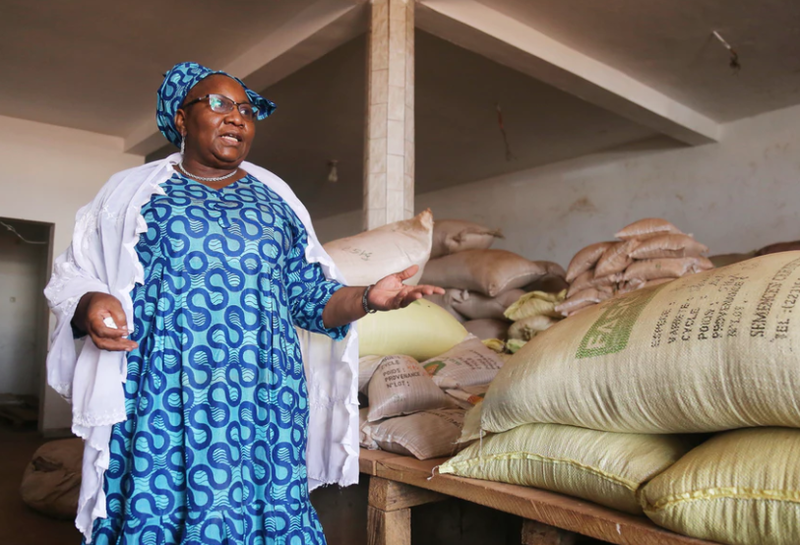 Years later, she has gained considerable recognition for her work, supported by USAID’s Feed the Future program, and is showing the world how woman-led entrepreneurship can reduce poverty and create a more food-secure future for Africa. About the Author: Anna Wangen is an Intern working on strategic communications for USAID’s Bureau of Legislative and Public Affairs.